Hi girlies! I've got a quick tutorial for you today showing you how I put together my Glitzy Flakes that I've been having so much fun making lately! 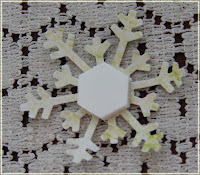 You can use any diecut, or snowflake punch. I've been partial to my new Martha Stewart punch. They are easy, but glue + glitter does happen to = MESSY so please forgive the picture of my gross glitter tray. It is a gluey mess, but that's why I only use that tray for glitter and glue. To begin, I punched out a snowflake with my MS punch. The type of paper doesn't matter because the Glitzy coverage is so complete you won't see it. I added a dimensional booster to the center, where I'll later attach my button. The important part here is to NOT remove the covering tape on the top. Leave that little hexagon on top - you'll work around it! Next, I coat the entire top of the flake with my Mono Tombo Adhesive - remember, this is where you work around the dimensional booster, don't glue over the top of that! 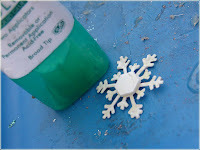 I use the applicator on the bottom of the container and just rub all over the surface of the snowflake. Then, I place it in my little tray (or over a piece of scrap paper) and coat it heavily with Glitzy from The Cat's Pajamas. 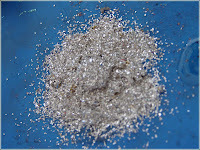 At this point, I can either use the "glitter pile" to make another flake, or funnel it back into the test tube. I've made a TON of projects with my silver glitzy and still have more than half the tube left. This glitter has amazing coverage!! Once the glue has dried, you can peel of that top layer of the dimensional booster and apply your button. 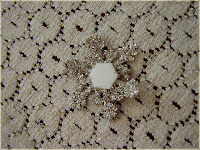 I use a pre-threaded button rather than fooling with it once it is on top of the snowflake. Here's a quick hint, I think the teeny buttons work best on the center of this sized flake. Today, I used my glitzy flake to be the dot on the top of the letter "J" on my gift tag. Now, if I had my act together I'd be able to spend today and tomorrow making tags for all my gifts. But, that is SO not going to happen. I have so much wrapping to do. 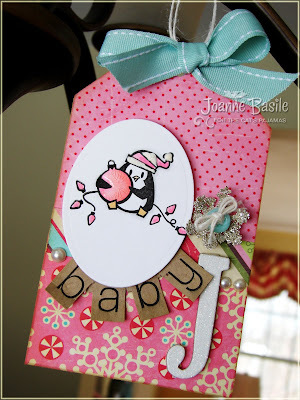 But at least I got to make one sweet little tag for my niece. I love making things for her, I get to let my love for PINK shine! This fun paper is Collage Press - Joyride and I'm lovin it! So sweet! I've used this adorable penguin stamp from "Give a Little" as well as the Coolvetica alphabet. ooo, I get to be the first to comment. how easy and absolutly perfect! love these, hmmmmmm, since we are coming into heart season, I might just have to try a glitzy heart! thanks, Joanne! Great tip on using one tray for glitter only, maybe I'll use it more if I do that! So darn messy. Thanks for the tutorial. Awesome! Thanks SO much for posting that Joanne - am going to try it for sure. I don't have that exact glitter though. Do you think the SU Dazzling Diamonds or Chunky Glitter would work? Love the tag! I may have to give this a try! What a great tutorial. The hardest part is being patient.